On one of the days, my sister proposed to go with my mom to Lyon, also known as the capitale of gastronomy in France, where many great chefs either started or made their own career, the most famous of all being Chef Paul Bocuse who unfortunately passed last year. So, not surprising, this icon of the French culinary world has a food hall named after him. This is where we started our visit. It was a week day so not all stalls were opened, but we got to salivate in front of lots of them: cheese, wine, cookies, pastries, chocolate, fish, foie gras and various animal pieces (some only French people would eat) were laid out in front of our hungry eyes. So, we decided to have a pre-lunch there, eating some frog legs at Cuisine Du Sud. The frog legs or cuisses de grenouilles were fried in lots of butter, with parsley and garlic. A bit pricey (21 euros), they were sublime! They were served with a gratin de pommes de terre / potato au gratin that was so good, having lots of cheese in it, that I forgot to photograph...Jodi on her side got a vegetable tatin tart that was quite good, a great option if you are vegetarian. 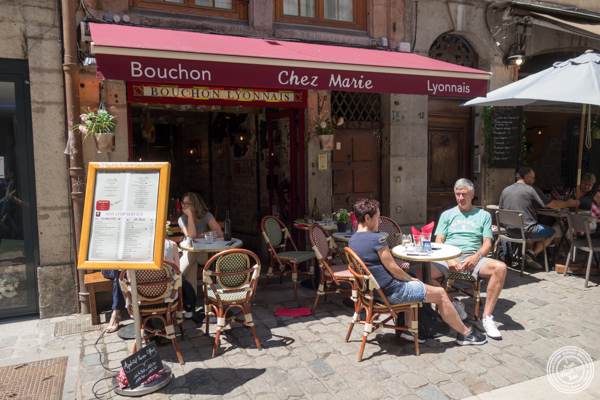 Then, we went to the old part of the city and settled at chez Marie, a restaurant with a small outdoor seating. Although I had frog legs before, I could not resist getting a second round of garlic with their escargots. I like this dish, not just because of the snails, but also because of the butter, garlic and parsley sauce that is so good you cannot not dip bread in it. Jodi on her side got a goat cheese salad with honey. For my entree, I went for a specialty from that area: quenelle sauce nantua, that is a pike soufflé with a lobster sauce. This was fantastic: the quenelle was perfectly made, quite light and the sauce was the star definitely, being delicious and tasty, perfect with just the quenelle or with the rice that came with the dish. Last was dessert. I admit that I was looking forward to getting a praline tart, also a specialty from there, that I ate few hours before (just a small piece), but, unfortunately, it was not good, tasting like jello. Despite that, the rest of the food was quite good, but I am sure the other restaurants in that area are similar. So, next time, I will continue to explore.